CHIMES AT MIDNIGHT at Film Forum, with a Skype call to Beatrice Welles introducing it. A full house – during the Super Bowl, which I gather is kind of a big deal en Amerique – because it’s a rarely screened movie. Though for the internet-savvy, ethically unclean bootlegging type of cinephile, almost nothing is rare anymore. But I’d certainly never had an opportunity to see Welles’ masterpiece on the big screen, and I hadn’t seen this new restoration. Unfortunately, for reasons no doubt clear to the architect, the auditorium at Film Forum is built along the lines of a corridor in a German expressionist film, and we were at the back, viewing the screen as a tiny, distant window in the darkness. I could easily arrange my TV at home to fill a larger percentage of my field of vision. But I would have missed the intro, the Q&A, and the audience, who worked their way through the various kinds of laughter Shakespearian comedies get: from the “I understood that!” laugh, which is essentially humourless, to the “I understood that and it’s actually funny!” laugh, which is wonderful to hear. Beatrice W claimed the film was missing a couple of shots from the Battle of Shrewsbury, but I didn’t spot any gaps. There are several shots in that montage which are ingrained quite specifically in my memory, and they were all present, but it’s such a long and complicated sequence that I guess some less obvious snippets could go astray and I might not notice. Still, I wouldn’t entirely take BW’s word for it without further evidence. After all, she claimed to be Welles’ executor, which I gather is not wholly true – she has the rights to OTHELLO and nothing else, though that hasn’t stopped her threatening with legal action anyone who tries to restore or complete a Welles film. (It seemed like she BELIEVES she embodies Welles’ estate, though, just as she states that her parents stayed married all their lives, ignoring the fact that Welles was living with Oja Kodar for most of that time.) She managed to get the TOUCH OF EVIL restoration pulled from Cannes, and delayed THE OTHER SIDE OF THE WIND for so long that the editor patiently waiting to complete it, Frank Mazzola, has died of old age. Plus, her “restoration” of OTHELLO is so inauthentic and misguided that I would hesitate before accepting her views of any other restoration job. It was a relief to see that CHIMES’ restoration hasn’t resulted in a soundtrack cleaned up to a level of purity in never had. The synch is still uncertain – Welles is content to have characters walk through shot, albeit briskly, lips clamped shut, while their voices rabbit on over the soundtrack, so no amount of digital jiggery-pokery was ever going to render things conventionally polished. But this hardly matters. By focussing on technical flaws like this, Pauline Kael damaged the movie’s chances in America. 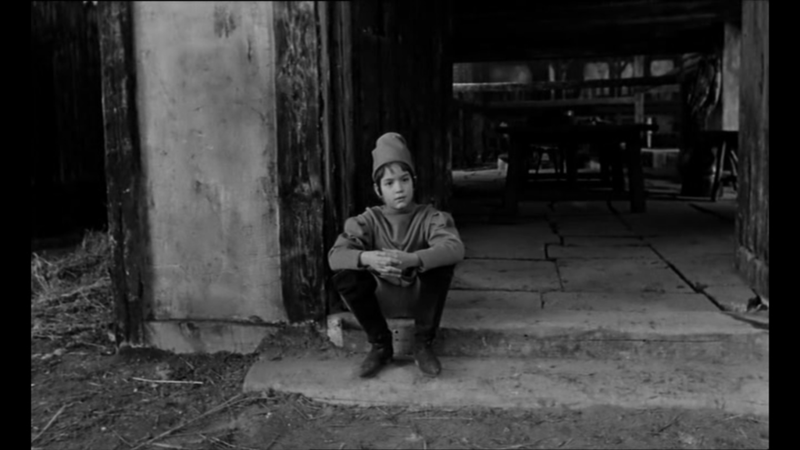 To really love it, you have to accept Welles’ slightly idiosyncratic technical standards. 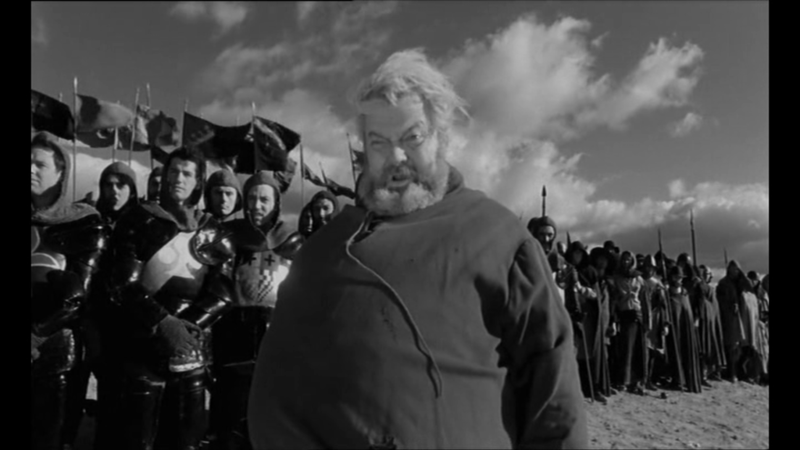 Welles described his interpretation of Falstaff as being “like a magnificent Christmas tree decorated with vices, but the tree itself is pure and good” – and the film could be said to be similar. 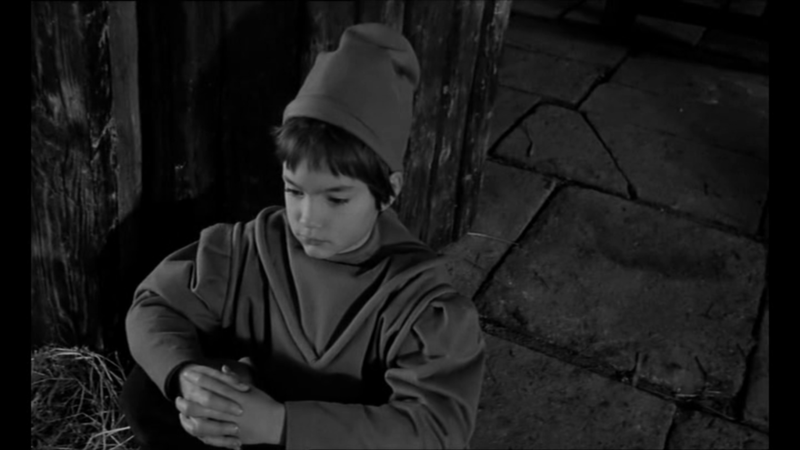 Occasional lapses in the generally splendid production values, bold edits that don’t quite come off, dubbed Spaniards who look like dubbed Spaniards – these gives critics something to talk about but are irrelevant to the film’s sweep, beauty and emotional affect, which is greater than any other Welles movie. The q&a after the screenings featured some pretty lame questions from the public, but fair play to Beatrice, she did manage to answer most of them in a way that was informative. Apart from being dubbed herself, she mentioned that she was also doubled, since she came down with rheumatic fever, so every time we don’t see her face, it’s actually a little French schoolboy playing the part. But then, everyone else is doubled too – I expect the clanking, armoured Falstaff who galumphs robotically about the battlefield isn’t Welles, and since Gielgud and Moreau were available for short snatches of shooting, any time you don’t see them clearly it’s someone else in a crown or a wig. “What happened to Keith Baxter?” asked our screening companion, Farran Smith Nehme, the Self-Styled Siren, and I had to admit I don’t know. He should have had a much bigger career, I would have thought. Of course, he had the benefit of a great director here, but then so did Robert Arden in MR ARKADIN and he still came rigid and irksome. Baxter had real talent — and didn’t make another film for five years. A thousand thanks to the Siren for a lovely evening!